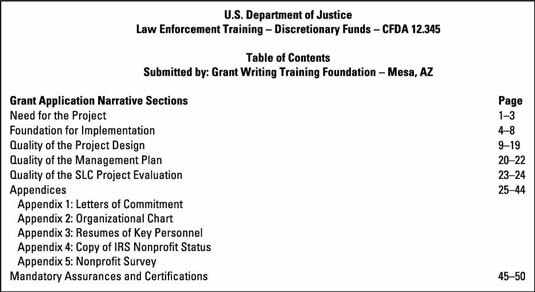 Whether you include a table of contents depends on the grant application guidelines. Rigidly structured guidelines typically call for a table of contents, particularly if the narrative is long (more than ten pages) or if you’re asked to provide several attachments or appendixes. The table of contents shouldn’t include the abstract or executive summary because those parts almost always precede the table of contents. Exceptions to this rule are applications from state or federal agencies that stipulate a format in which the table of contents comes before the abstract or executive summary. Grant guidelines and writing formats vary from one agency to another and even within departments in an agency, so be sure to read the grant application guidelines and follow the format listed in the reviewer’s criteria. The reader expects to see sections and subsections of the grant application listed. Appendixes must be listed and numbered.